Although he officially forsook the sword, it was rumored that he continued to practice the Way known as Shehai Shen She Ru -- the Way of the Spirit Sword. When Emperor Hira began to persecute the sword-singers, Divad was first on his list due to his fame. The emperor sent 100 of his best guards to arrest him, and they arrived while Divad was eating with his elderly mother. They successfully arrested him and had him in chains when one of the guards cruelly struck his mother, killing her. That instant, the spirit of the Way awoke in Divad, and he turned his own chains into weapons, slaying four guards and escaping out of the window. He became a prominent figure in the resistance against Hira, rumored to appear everywhere the emperor's plans went awry. He approached his father as well, and ultimately convinced him to lead the war against the emperor, with Divad as an advisor and soldier. Divad and Frandar later took part in the great Ra Gada migration to mainland Hammerfell. With his band of Sword-Singers, he forged and wielded five mighty Shehai to defeat the goblinkin occupying the land and make it safe for settlement. For these accomplishments, Divad is considered one of the great heroes of Redguard legend, yet in the epic poem Divad's Chagrin, it is said that he deeply regretted having to leave behind his music and turn to war. 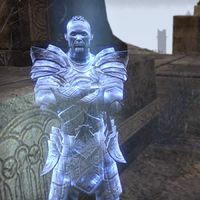 Divad's tomb is located in the sacred Hall of Heroes, alongside his father's, but his body was laid to rest in ancestral crypt of the Valley of Blades at some point.